Parents know the convenience that a baby monitor provides. It has made their lives a lot easier when it comes to keeping their babies safe and secure. A baby monitor allows them to check on their baby even as they do other things around the house. Without this tool, it’s actually very hard to be productive because you have to constantly check on your baby. Also, baby monitors help parents keep track of their baby’s sleep schedule. Being able to constantly check on their child lets them know if they’ve had enough sleep. And with that information, they can sleep train them and adjust their sleeping patterns. Using a baby monitor doesn’t only benefit the baby, it also helps the parent get more sleep and enough space to do personal stuff. Baby monitors come in all shapes and sizes. There are several types of this gadget that one can choose from. If you are looking for a baby monitor product that is ideal for you, you have to specify your baby monitoring needs and also consider your budget. That will help you determine which product is perfect for you. A smart move would be to start your shopping with the best sellers in the market. This will give you an idea of which features you need the most and which ones you’re willing to compromise. You can start by checking out one of the bestsellers like the Minilabo Video Baby Monitor. Minilabo is a trusted brand when it comes to baby proofing gadgets. Like every parent out there, their main focus is keeping babies safe and secure by providing a technology that parents can rely on. This vision is translated in every product they design, including products like the Minilabo Video Baby Monitor. Minilabo is committed to providing the best quality child proofing gadgets, and it is evident in its Video Baby Monitor model. 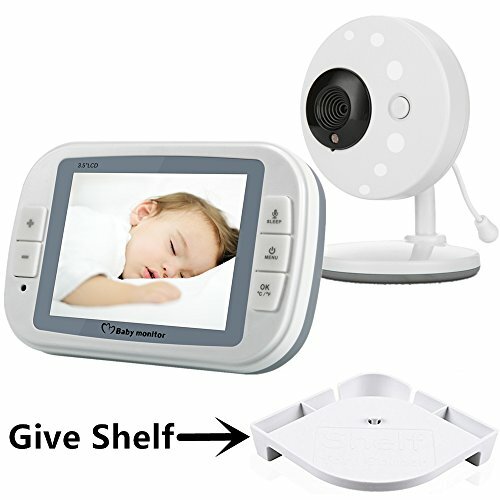 It sports impressive features that make it a very reliable baby monitor unit. Featuring an enhanced wireless digital technology, it can transmit clear and crisp images securely at 2.4 GHz without you having to worry about any radiation effects. You can view clear video feed on a 2.4-inch screen and can also talk to your baby with its two-way talk functionality. The added feature such as a night-vision property with its built-in LED lights allows you to see images in the room even in low light conditions. It also has temperature sensors so you can monitor the condition of the room and check if your baby is comfortable enough. The highlight feature of this baby monitor unit is its sound-activated Eco mode, which is designed to optimize the battery and reduce the frequency of recharging the battery. It is also capable of connecting up to four cameras so you can maximize the scope of your view. A highlighted feature of the Minilabo Video baby monitor is its multiple camera connectivity. However, it only comes with one camera and you have to purchase the camera add-ons separately. If you have been reading some reviews on baby monitor products, you may already have an idea of what an average baby monitor model is like – and it certainly is not the Minilabo Video Baby monitor. This unit comes at a rather reasonable price but its features are easily comparable to high-end baby monitor units. It is very versatile and it offers you advanced functionality that you can’t find in an entry-level baby monitor. It transmits sound and images efficiently and it does so without consuming a lot of energy. Its features are rather impressive and it is easily one of the most reliable products you can find in the market today. Two well-reviewed best sellers you can find in the market today are the Minilabo video baby monitor and the Palermo Wi-Fi Video baby monitor. Both basically have the same features but the latter comes with an app that can be installed on a phone. However, this app hasn’t been perfected yet.